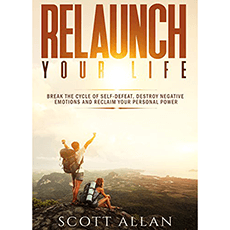 “Relaunch Your Life” offers the skills and strategies to eliminate self-defeating behaviour. It serves as a guide through the four mindsets failing you. It shows you how to convert negative emotions to positive emotions focused on self-love and accepting you who are, with true value. This book is intended to help you live a more fulfilling lifestyle. Chapter 2: Justifying the Evidence - Are You Good Enough? Did You Enjoy Relaunch Your Life?